A transcript of John Paul Jones’ evidence given at the recent Led Zeppelin Stairway To Heaven plagiarism trial has been published online. The bassist and keyboardist gave his testimony at the trial in a California court in June. The band were then cleared of having copied the opening chords of Spirit song Taurus, which was released three years before the Led Zeppelin classic. The full transcript has been published by Rolling Stone and can be viewed below. It follows earlier publications of testimonies from vocalist Robert Plant and guitarist Jimmy Page. The evidence quashed the long-held narrative that Plant and Page had came home from Bron-Yr-Aur cottage in the Welsh mountains with the opening sequence to Stairway To Heaven written to show the rest of the band in 1970. But the legal argument centred on the suggestion that the chord sequence in question had been in use for three centuries. That, and other points, led to the case being found in Jimmy Page and Robert Plant’s favour – though they lost their bid to recoup almost $800,000 in legal fees after they were cleared. He is currently serving a three month suspension for his conduct in an earlier rights trial. LOS ANGELES, CALIFORNIA, FRIDAY, JUNE 17, 2016 3:20 P.M. THE CLERK: Please raise your right hand. Do you solemnly swear that the testimony you shall give in the cause now before this Court shall be the truth, the whole truth, and nothing but the truth, so help you God? THE CLERK: Please be seated. You can adjust the microphone as you need it. May I ask that you state your full name for the record and spell your last name. THE WITNESS: Yes. 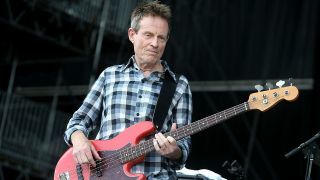 My name is John Baldwin, professionally known as John Paul Jones. Q. Good afternoon, sir. You are a member of Led Zeppelin? Q. And what was your role in Led Zeppelin? A. Mainly bass player, keyboard player, occasional songwriter. Q. When did you first publicly perform music? A. When I was 14 years old. I’m from a musical family. Q. And what was the context? Where were you performing? A. Well, I was performing with my father’s trio as a bass player and also I was playing organ in church and I was choir master, as well. Q. When did you first perform professionally? A. Professionally, I was in smaller bands when I was 16. We were doing local dances and then also American Air Force bases often around the country in England. Q. When you were 17, were you a member of a band? A. Yes. There was a fairly major band. We had three Top 10 instrumental hits and toured in England, nowhere else. Q. What was the name of the band? A. It was named after the two stars. They were Jet Harris and Tony Meehan, who were, in fact, the rhythm section for another band called The Shadows, which was a much bigger affair. Q. Thank you. And what did you do next in your career as a professional musician? A. Tony Meehan, who was the drummer of that band, was also a record producer, and I played on his sessions. And I also became an arranger, a musical director for Andrew Oldham and various other people and then started just doing a lot of sessions. Q. Okay. As a – does being a session musician require creativity? Q. And can you explain why it does? A. Well, especially in the rhythm section. If you are a string player or trumpet player, you would have all the notes set out for you and you would pretty much play what’s written. In the rhythm section, you had much more freedom, and you were just given charts which set out chord symbols, which were – which gave you the harmony, and you would then improvise your parts. Q. Could you please tell us some of the recording artists that – or records that you were involved with as a session musician or arranger prior to joining Led Zeppelin? A. Okay. Well, I was musical director for Mickie Most. That was probably the most productive time. That was arranging and playing for Herman’s Hermits, Donovan, Lulu. I did To Sir With Love. Herman’s Hermit, I did A Kind of Hush, No Milk Today. Donovan, I did Hurdy Gurdy Man, Mellow Yellow, all those arrangements. I’m playing on them, too. Q. Did you work on any recordings by the Rolling Stones? A. There was – there was a song called She’s a Rainbow which had a string section on it and piano. I did that. THE COURT: Okay. Keep your voice up so we can hear you. Q. I don’t know if you mentioned it. Did you work on A Kind of Hush and on Dusty Springfield recordings? Q. Did you work on the music for Goldfinger? A. Yes. Yes. I was playing bass on Goldfinger and actually Jimmy was playing guitar. Q. By “Jimmy,” you mean Jimmy Page? A. Jimmy Page, yes. We sat next to each other. Q. Did you do any arranging or performing on recordings or session work with the Yardbirds? A. Yes. I did one – one album. Little Games I think it may have been called. That was when I was working with Mickie Most, as well, when the Yardbirds were produced by Mickie Most with just a few things. Q. And how did you come to be a member of Led Zeppelin? THE WITNESS: He was – he said he was going up north to – to see a singer, to hear a singer, who he thought also knew a drummer. And the singer was Robert Plant and the drummer was John Bonham. Q. What year was Led Zeppelin formed? Q. Did Led Zeppelin play in any countries before first touring in the United States? A. Yes. We played in Scandinavia. Q. Did Led Zeppelin play or perform in Denver in December of 1968? A. Yes, we did. It was the first show. Q. Who else was at – what other group or groups were at the show? A. Well, we were opening for Vanilla Fudge, and I understand Spirit was there, too. Q. And how did you come to understand that Spirit was there? A. I think later on. I think when this lawsuit came up. Q. Okay. Have you ever seen Spirit perform? A. I didn’t recall it, no. Q. Have you ever owned any Spirit albums? Q. Have you ever owned any Spirit singles? Q. Did you ever meet Randy California? Q. Did you ever meet him under the name Randy Wolfe? Q. What were your musical tastes back in the late 1960s and ‘70s? A. Some classical, but by then mainly jazz and rhythm and blues or soul music, as it was called in those days, Motown, Stax. Q. Other than as a member of Led Zeppelin for a performance, did you ever go to rock concerts? Q. Did Led Zeppelin perform at the Northern California Folk Rock Festival in San Jose, California in May of 1969? Q. Where were you when you first heard any version of what became Stairway to Heaven? A. At an old rambling house in Surrey called Headley Grange. Q. Is that in England? Q. And what was your involvement when the musical composition Stairway to Heaven was completed? A. Jimmy first played it to me on the acoustic guitar, and I was on the electric piano nearby. And I think the idea was just to – just to work on the song and figure out what went where, and I was helping him arrange it. Q. Okay. Where was Stairway to Heaven recorded? Q. Where was Stairway to Heaven recorded? A. Oh. At the Highland Studios in London. Q. Do you know who Toby Roberts is? Q. And who was Toby Roberts? A. He was involved in the leasing of an aircraft, I think. Q. Was it at the beginning of the formation of Led Zeppelin? A. No. No. We toured by car in those days. The plane came later. It was a big reward. So it must have been ‘74, ‘75 maybe. MR. ANDERSON: Thank you. That’s all the questions I have for you. MR. ANDERSON: Oh, I’m sorry. I have one more question, if I may. Q. Counsel played an audio recording that purports to be you and your voice referring to Mr. Page and Mr. Plant coming back from Bron-Yr-Aur, and that related somehow to Stairway to Heaven. Do you have any knowledge of Stairway to Heaven or what became Stairway to Heaven prior to hearing Mr. Page play it for you at Headley Grange? Q. And – okay. Thank you. THE COURT: Okay. Cross-examination, counsel. Q. Do you recall every concert you were at in 1968? Q. Do you recall every concert you were at in 1969? Q. All right. Now, do you remember giving an interview in the early ‘70s about Jimmy Page and Robert Plant coming back from a cottage called Bron-Yr-Aur with a guitar intro and verse for Stairway to Heaven? MR. MALOFIY: Please play 164-A. THE CLERK: What was the number? MR. MALOFIY: 164-A. My apologies. 100164 audio. Q. Do you recognize that person’s voice? Q. All right. Did you hear what the recording said? Q. All right. And it said that they had come back from a Welsh cottage with a guitar intro and a verse. Did I hear that correctly? Q. Okay. Is your memory correct – is your memory as accurate today as it would have been in 1972? THE COURT: He already answered yes. Q. Do you dispute that statement, sir? A. I was – it sounds like I was guessing at the time. Q. So are you guessing today or you were guessing in 1972, a year after it was written? MR. ANDERSON: Objection, Your Honor. Argumentative. Q. Are you guessing today or do you know? THE WITNESS: I was guessing in 1972. Q. So your memory is better today than in 1972? THE WITNESS: No. I do. MR. MALOFIY: I’d like to move that into evidence. THE COURT: Move what into evidence? MR. MALOFIY: Oh, I think it was already moved into evidence. THE COURT: I think it was, yeah. MR. MALOFIY: Yeah. Yeah, I believe it was. Q. In 19 – before you even played any show on U.S. soil as Led Zeppelin, you were familiar with the band Spirit by playing a portion of their music, “Fresh Garbage,” correct? Q. You played the song – you played a portion of the composition “Fresh Garbage” as part of your live set, correct? Q. And you did that before you played your first show on U.S. soil in – December 26, 1968, correct? A. As I understand, yes. Q. Okay. And you, in fact, learned of that piece of music, I believe your testimony was, from the radio or the TV? A. Well, either the radio or the TV, yes. Q. Did any of the other members of Led Zeppelin introduce it to you or did you learn of that song on your own? Q. Now, did you introduce that song to the band or did someone else? Q. And of the thousands of artists that you could have chose to cover their music, you covered a song by a relatively somewhat known band at that point called Spirit, correct? MR. ANDERSON: Objection, Your Honor. Lacks foundation. THE WITNESS: What I did was just pick a two-bar bass riff which popped out of whatever – however I heard it and played that. I didn’t know who it was, what it was. It was a catchy little riff, it had a little quirky time thing, and it caught my ear. Q. You believe you – you consciously copied that music, correct? THE COURT: Sustained as to the question. Q. – or the medley – excuse me – or the medley As Long As I Have You? THE WITNESS: I just took that two-bar bass riff. I didn’t know where it was from. I just heard it. Q. Did Mr. Page ever tell you that he had – he was a fan of Spirit? Q. Did he ever share with you that he was a fan of Spirit in the ‘60s during the time when the first four albums came out? Q. Did he ever share with you that he has six – five albums of Spirit in his collection today, which he bought during the time? MR. ANDERSON: Objection. Argumentative. Mischaracterizes the testimony. MR. MALOFIY: I’ll withdraw the question. Q. Did Mr. Page ever tell you that he had five albums of Spirit, one being a double album, in his record collection? THE COURT: Overruled. Did he ever tell you that? Q. Do you know anyone else that you’re – that you acquaint with that has five or more albums of Spirit? Q. Did you ever ask Robert Plant if he has albums of Spirit? Q. Did you ever check your record collection to see if you had any albums of Spirit? Q. And is the answer no? MR. MALOFIY: Understood. Thank you. Q. Initially, when you were playing as a session musician, you were playing other people’s music, correct? Q. And in playing other people’s music, they would give you sheet music and you would follow it. So your skill as a bass guitarist or other multi-instrumentalist would be to put down in recorded music to be distributed or to be sold, correct? MR. ANDERSON: Objection. Compound. Vague and ambiguous and argumentative. THE COURT: You lost me on it, too. Why don’t you state the question again. Q. As a session musician, you would play sheet music or you would play music for other people, correct? Q. And this wasn’t original compositions, these were compositions of other people that you were playing for, correct? Q. In doing so, you would agree that Led Zeppelin initially, when it was first formed, had to jump on tour immediately, correct? A. I’m sorry. I didn’t understand. Q. I’m sorry. Let me restate it. When Led Zeppelin was first formed, you immediately went touring with Mr. Page, correct? MR. ANDERSON: Objection. Lacks foundation. Calls for a conclusion. THE COURT: If you know. If you know. Q. – from his prior band? Excuse me. Q. Okay. And in doing so, did you have to come up with – or did you attempt to come up with new original material in a very short period of time? Q. And in doing so, would you agree that you took covers and you played those covers as part of your live sets often? Q. And would you agree that all of the staple songs that you were playing in late 1968 and early 1969 were covers of other people’s music? THE COURT: You got about two minutes. MR. MALOFIY: Yes. 538 very quickly. Can we pull that up? I believe we used it already in this case, and I believe it was admitted. If it’s not, I ask for its admission. It’s just a track list from Gonzaga, which we used in Mr. Page’s depo- – Mr. Page’s testimony. THE COURT: Is there any objection, counsel? MR. MALOFIY: Would you like to take a look, Mr. Anderson? We have it right here. MR. ANDERSON: Relevance, Your Honor. I do now know what it is under a different exhibit number. MR. MALOFIY: May we publish it to the jury? Q. Sir, do I refer to you as Mr. Baldwin? I’m not sure what name you prefer. A. Mr. Jones will do. Q. Mr. Jones. Mr. Jones, you’d agree that Train Kept A-Rollin was a cover song that you performed? A. Yes. I thought they were all Yardbirds songs. Q. Is that what you thought? Q. “I Can’t Quit You.” Do you understand that’s a cover song? Q. You believe it was the Yardbirds song? Q. As Long As I Have You with the Fresh Garbage melody contained therein, did you understand that to be cover songs? THE COURT: Why don’t you restate the question, but this will be your last question. Q. The other songs here, As Long As I Have You, Dazed and Confused, White Summer, and How Many More Times, they were all cover songs that you were performing with Led Zeppelin, correct? Q. You believed them to be Yardbirds songs? MR. ANDERSON: Just briefly, Your Honor. Q. Counsel asked you about session musicians and you – and playing other people’s music. As part of your work as a session musician in the 1960s, did you just play what was written on sheet music that was given to you? A. Sometimes the parts were very concise with written – written notes. Other times, they would just be chord symbols and then you would have to make up your own part, which, with the rhythm section, happened quite a lot. Q. Okay. And did you do a lot of session work in the rhythm section? A. Yes, I did. It was the whole rhythm section. Q. What do you mean by the “rhythm section”? THE COURT: Okay. You may step down, sir. You may step down. THE COURT: Any reason why this witness can’t be excused? Okay. You’re free to go. Thank you for coming in today, sir.